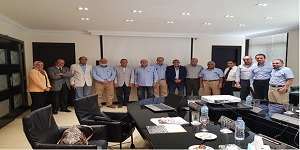 A delegation of the faculty of Engineering paid a visit to the Iron and Steel Company on Monday 30/7/2018. The delegation was comprised of Prof. Mohamed Gaber, the Dean of the faculty of Engineering; Prof. Mohamed Naem Anwar, the Vice Dean of the faculty of Engineering for Education and Student Affairs; Prof. Alaa Shabel, the Head of the Petrochemical Engineering Department; Prof. Mohamed Abdel Rahman, the Head of the Electrical Engineering Department; Dr. Marwa Abdel Fattah, an associate professor at the Petrochemical Engineering Department. The PUA delegation was escorted in a tour to be conversant with the different industrial processes in the factory. A meeting was then convened between the PUA Engineering delegation and the company’s managers and the heads of different departments where Prof. Mohamed Gaber made a presentation of the faculty of Engineering; its departments, the Engineering Programs running between Pharos University and the KTH Royal Institute of Technology as well as the accreditation obtained by the faculty of Engineering from the National Authority for Quality Assurance and Accreditation of Education (NAQAAE). Among the points underlined during the meeting were also the importance of field training, the necessity of preparing students for labour market before graduation and seeking means of cooperation between the company and the faculty of Engineering.